Spotted: an article from New Zealand which goes inside the mind of a quiz sceptic who becomes a pub quiz fan. The writer, Matt Lawrey, starts off by saying "I thought there was something a bit quaint about quiz nights. They always struck me as an activity for people who needed excuses to go to the pub and talk to people." But after being recruited to a team on the strength of his film knowledge he quickly gets int the swing of things: "a few pints of Murphy's Red and a large plate of nachos later, I had gone from friendly, joy-to-the-world, egalitarian Matt to ultra-competitive, take-the-bastards-down, quite probably fascist Matt. It wasn't a pretty sight but, damn, it felt good." The Wee Man and Bratchy are a pair of comedy characters who claim that regular pub quizzes are "dull". Read more: Art, Comedy or Quiz? Top Indian Quizmaster Giri 'Pickbrain' Balasubramanyam was asked in an interview about what efforts go into creating great quiz questions. His answer included a memorable metaphor that only an Indian quizmaster could produce. Everybody's tweeting. But what are they saying about the pub quizzes in their lives? "At the pub quiz. We got my brother-in-law with us this week. Sports round gonna get OWNED! 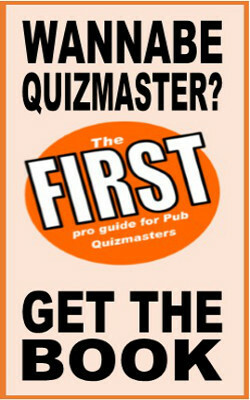 http://twitpic.com/bqesj"
Which shows the need for taking a specialist along if you're actually trying to win a quiz. Can You Charge £1000 for a Quiz Night? Could You Write A Quiz in TWO Languages?